On Tuesday afternoons, while the Florida sun is beating down and the cicadas are chirping in their never-ending symphony, Diane Nghi can be found in the Pine Manor community garden picking Malabar spinach for her homemade meatball and mixed greens soup. 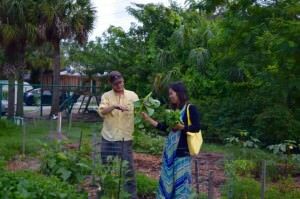 Though Nghi is now a familiar face at the community center, her story at Pine Manor actually begins at the Goodwill Industries of Southwest Florida MicroEnterprise Institute. The month-long program designed to help aspiring entrepreneurs become self-sufficient, is where Nghi found herself when she realized that she wanted to start her own catering business. 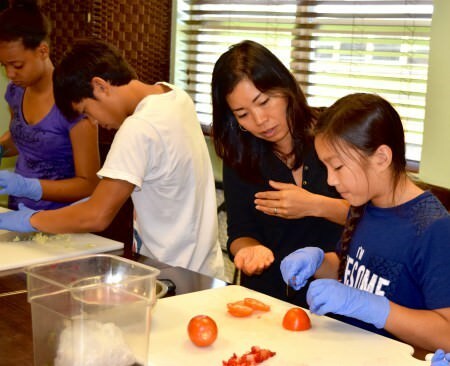 It was during this time that Dorothy Browning, community education manager at Goodwill Industries of Southwest Florida, told Nghi about a one-week culinary program that was offered at the Pine Manor Community Center. Nghi, who was in the process of starting her catering business, was immediately interested. In fact, she enjoyed the experience so much that after completing the class, she decided to take the three-week version with her 17-year-old son a few months later and even enrolled two of her other children in the teen program. Nghi, a mother of six, believes that the culinary skills acquired in the classes will be invaluable to her children in the future. However, Nghi’s children are not the only ones who have picked up valuable skills from the classes. Nghi herself has learned techniques and tips that she implements in her catering business. Nghi began her business, The Thuy House, as a way to empower busy moms. From spring rolls to empanadas, Nghi’s healthy, delicious meals are filled with fresh vegetables and herbs, some of which even come from the Pine Manor community garden. Nghi, who was raised in Vietnam, grew up eating the fresh produce from her family’s garden. For Nghi and her husband, the vegetables from the community garden help to continue the tradition of healthy, nutritious eating with their own children. 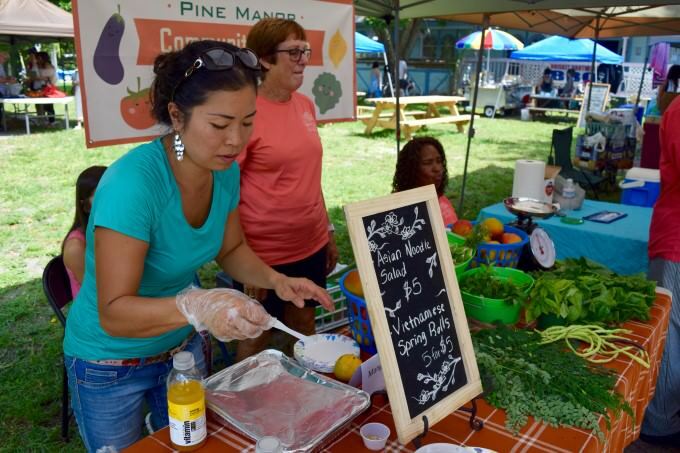 On Saturdays, Nghi and her daughter have started joining fellow Pine Manor gardeners at the Alliance for the Arts GreenMarket where she has been selling her homemade creations. Although she has only been attending the market for a few weeks, she already has returning customers and has sold out of favorites like her Asian noodle salad. “Sometimes when you make something good and fresh and flavorful the food speaks for itself,” Nghi says, “I’m very proud of the food that I produce. Soon, Nghi would also like to start providing cooking classes to mothers and daughters, friends, and couples. Nghi hopes that through these classes she can not only provide participants with basic culinary skills, but also inspire people to enjoy the freedom that comes with cooking. Kelsey is a rising junior at the University of Florida. In its second year, the Southwest Florida Community Foundation is partnering with University of Florida’s public interest communication program with the 2016 Florida Fellows. Funded by a donor who is supporting the paid summer fellowships for PR students, the Community Foundation embedded these students into nonprofit organizations the foundation has funded with a grant this past year in a continued effort to support the nonprofit, to provide the organization with resources and greater assistance in developing the organization’s messaging and storytelling.